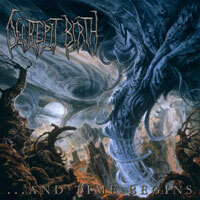 Decrepit Birth is a modern style death metal band, building upon the blocks of the early 90's death metal scene. "We are a band with serious intentions to create an original sound, with great speed and accuracy." Originally formed in the mid 90's by guitarist Matt Sotelo, and vocalist Bill Robinson, the intentions of this band have always been the same...ultimate brutality. In September of 2001 Matt and Bill joined forces with ex-DEPRECATED bassist Derek Boyer. The three of them started writing material for a full-length CD. The band brought drummer Kevin Talley (ex-DYING FETUS/MISERY INDEX) out, and recorded a pre-release version of "Prelude to the Apocalypse". Luckily, Unique Leader Records offered them a deal, and they happily accepted. They were still one man short for the record, they needed a solid drummer, with all the skills for blasting and lots of fast double bass. Erik of Unique Leader offered to bring Tim Yeung out for the session. "We knew of Tim's insane skills from his work with bands like HATE ETERNAL, AGIEL, and AURORA BOREALIS." Tim came out to Matt's home recording studio to begin tracking for the up-coming release titled '...And Time Begins'. The band completed the recording over a four month period. The album became available on Unique Leader Records in stores world wide October 2003. After that, Bassist Derek Boyer got the call from death metal legends SUFFOCATION to join their ranks full time. So it was time for Matt and Bill to search for a new bassist in addition to a second guitarist and drummer. 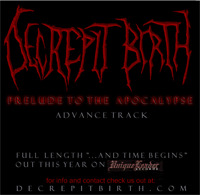 The underground success, and many positive reviews of '...And Time Begins' brought an army of new fans and a huge buzz for Decrepit Birth. Over the first year of the albums release we tried out many different musicians, until we came across a couple of old friends in guitarist Mike Turner and bassist Risha Eryavec. We had worked with Risha back in the mid nineties, so we knew he had the abilities. Mike stepped up to the plate and showed us what he was capable of on the guitar, and from there Mike and Risha became full time members. So Decrepit Birth was complete in the strings department. Still, after months the hunt for a drummer was on. Guitarist Matt Sotelo recorded a young, up and coming band called ODIOUS MORTEM in his studio, and took notice of the awesome skills of drummer KC Howard. A short time later, KC came out to the rehearsal room for a tryout, and completely nailed three songs right away. 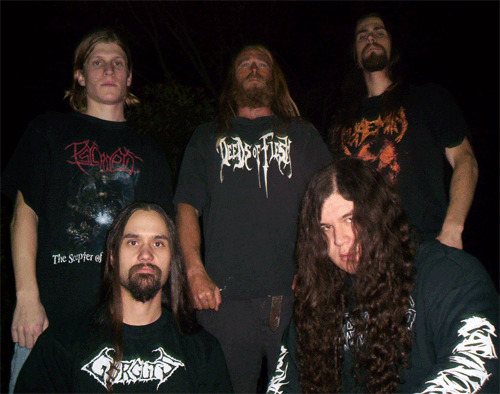 So in 2004 KC Howard became a full time member of Decrepit Birth, while still playing in his own band ODIOUS MORTEM. From there on Decrepit Birth played many West Coast shows with bands such as Disgorge, Severed Savior, Origin and Suffocation. During that time the band has been working very hard writing new songs for the next album, which will prove to be a much more mature, and multi dimensional album.